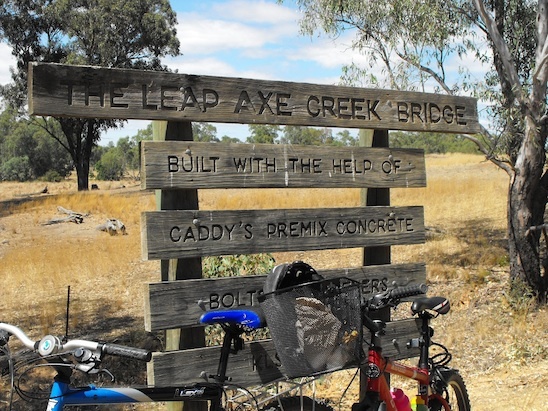 Why a ‘Last Chance’ ride to the Axe Creek Swing Bridge? Well, the aging Axe Creek Swing Bridge’s last full day was expected to be January 15, to be followed by the start of its demolition on Monday 16th. Nearing 19 years old, the swing bridge is to be replaced by a fixed span steel bridge for improved access on a new alignment with the existing trail. 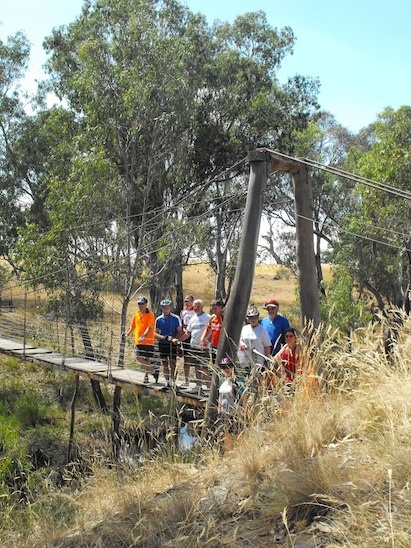 So a ‘Last Chance – Axe Creek Swing Bridge Ride on the O’Keefe Rail Trail was planned and successfully run by the Friends of the Bendigo-Kilmore Rail Trail on Sunday 15th January 2012. The ride’s start point was near Weeroona Ave/Bendigo Creek Trail, at Lake Weeroona’s northern car park. Once on the O’Keefe trail, riders immediately experienced the new drainage and surface material upgrade works that Council completed in mid 2011. Then the Council’s current base upgrade works, for another section of the trail are presently under construction adjacent to the Mayfair Industrial Park in Bendigo East, were also observed. A final gravel-sand surface is to be applied in the coming week or two. Next to be observed was the Friends of the Bendigo-Kilmore Rail Trail’s replica Rifle Butts Platform project, adjacent Pratts Park Road, which is nearing completion. Of course riders enjoyed the many other natural attributes as their ride progressed, that come with riding on the O’Keefe Rail Traill. 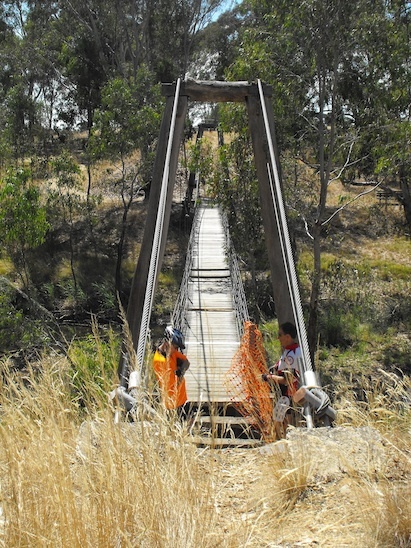 Once at Axe Creek, the swing bridge provided a photo opportunity for the ride participants. History was being captured, as this the second bridge over the Axe Creek at this location in 123 years is to make way for a third bridge. To span this picturesque creek location, where a natural rock reef forms a natural weir in the creek down stream, this new bridge will be well above the permanent water catchment in the creek. This natural creek environment is where numerous rest stops and picnics have been experienced by many trail users over the years. The riders then returned to Bendigo, via the O’Keefe trail, enjoying this local attraction and perfect weather as a bonus. NOTE to all trail users: As the section of trail between Hodges Lane and Longlea Lane will now be closed to all trail users, while bridge contractors conduct site works and the new bridge installation, a trail bypass route (via the McIvor Highway) has been signed. Friends final stand on the Axe Creek Swing Bridge - January 15th, 2012.